Tribord, French Aquatic Brand of Decathlon is one of our biggest client. We are working with them for 6 years now in photo and video : catalogs, PLV, merchandising, etc…. Tribord has a special guideline and that’s always interesting to work with them. They produce photos and videos for a while and have a big experience in the production of images. This year, they choose to change a little bit their process and the internal organisation to improve the level and quality of images. We were lucky to be choose to work on this photographic project. The main difficulties for these kind of works are to have the best scene, the best light with the best angle. That’s not always easy to do it, especially when you’re dependant of the natural elements : waves, wind, light and have a big schedule. That’s really harder for us to work on this project than to make a watershot in a big barrel…. Only one shot will be used in every discipline and could be in a big format (5,5 * 5m) in front of every shops (500 in the world). It’s look easy but we try every time different composition and a little detail can kill the shot : an eye closed, a cloud, a lack of coordination between 2 models in the water, no smile, etc… Every photo needs to have an big impact and to present the tribord’s value : joy, happiness and the pleasure shared. Here are some shots of our work, if you visit www.tribord.com or used to go in the shop; you will see these images. Click on the image below to access the web gallery. 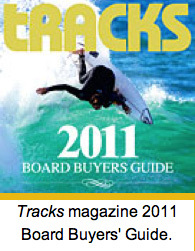 Damien made the cover of Tracks’s cover Board buyer’s guide with a shot of Dane Reynolds in France during Quik Pro France in October 2010. Damien just come back from a trip in Guadeloupe where he has shooted little waves close to the shore.